Riding a bicycle should be safe and easy — no matter your age, ability or where you live. A lot has changed since our founding as the Chicagoland Bicycle Federation in 1985, but encouraging more people to ride bikes remains at the core of our work. Through advocacy, education and good old-fashioned fun, we are committed to promoting bikes as a safe, healthy, affordable and environmentally-friendly way to get around. Throughout Chicagoland, many people would like to use bikes for transportation, but too few feel safe and comfortable doing so. That’s why we pursue a comprehensive strategy to remove the roadblocks preventing more people from taking to the streets on two wheels. 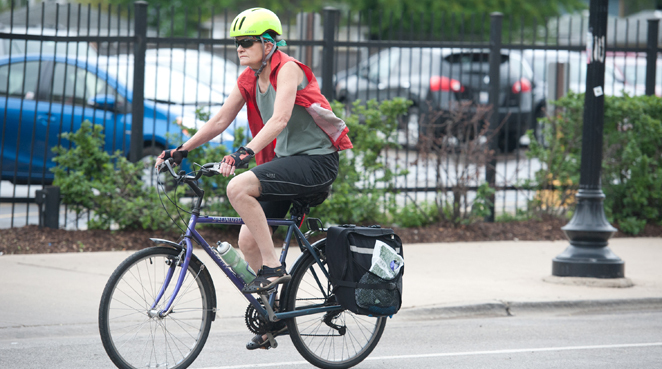 From providing bike safety education to school children to urging elected officials to invest in safer and better bike infrastructure, Active Trans is helping to transform Chicagoland into the most bike-friendly region in the country. 1991: The first edition of the Chicago Bike Map is produced completely by Chicagoland Bicycle Federation volunteers. 1993: CBF’s Bicycle Commuter Challenge encourages employees to try cardio-commuting for one week in June. 2001: The Chicago Department of Transportation takes on the CBF’s Bike Ambassador Program. The ambassadors begin educating thousands of people driving and bicycling each year. 2007: On the heels of a Chicago municipal ordinance, the Illinois General Assembly passes a Complete Streets law. 2011: Active Trans election advocacy leads to city setting goal to build 100 miles of protected bike lanes; first protected bike lane in the region installed on Kinzie Street. We work with local residents and community leaders to create more convenient biking options.